“I thought this book was cute. I liked the ending. All the illustrations were made with clay and paint. I thought that was neat. The art was my favorite part. The book is not that scary for little kids. People who like animals will like this book. It would be interesting to live in a place where the sun never sets. The joy of being outside and the beauty of the Arctic landscape are beautifully conveyed through Suzanne Del Rizzo’s artwork. I’ve oohed and aahed over her polymer clay and acrylic paint art that graced her own My Beautiful Birds and other picture books and Sun Dog is no exception. Those summer skies of yellow, pink, purple, and blue, with many shades in between, took me to that land of the midnight sun and the home of children who rarely saw themselves in books. 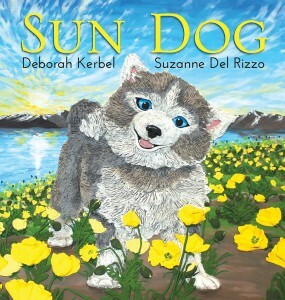 Within that landscape, Suzanne Del Rizzo brought playfulness and charm, with the reality necessary to tell Deborah Kerbel’s sweet story. —Linda Ludke, London Public Library, Ont. “Kerbel’s writing is so fluid and measured; while so much activity happens over the course of the picture book, Kerbel’s writing is focused, utterly inviting, and perfectly action-packed (yet not frightening for younger readers) when the climactic action occurs. Del Rizzo’s clay and acrylic art is so meticulously detailed and dynamic (from larger scenery to the smallest particulars)- I am in awe. There is one spread in particular in Sun Dog featuring the story’s polar bear that is incredible- quite a work of art….The combination of Kerbel’s storytelling and Del Rizzo’s art make for terrific reading, and I hope we get to see further collaborations from the duo. “This is a lovely story of the connection between Juno and her boy, but also of the high Arctic days, and the animals who call that part of the world their home. The illustrator of this book uses polymer clay as one element of the illustrations and I loved the effect. She brings alive Juno’s playfulness (I particularly liked the picture with the sock) and the beautiful environment Juno and her boy live in. The flowers look so real, I wanted to smell them!